The Mini (original) and MINI (modern) are global ICONS, with a history dating back to 1959 when William Morris first set up shop in Cowley and produced the Minis that our parents and grandparents drove. Back then, choices were key to their success and today your choice of MINI says so much more about you than just your choice of transport. It reflects your attitude, your style and your approach to life. MINI drivers are happier drivers and the myriad of choices and options that MINIs offer reflect the wealth of diversity of MINI drivers. More MINIs have names than any other model of car, but then MINIs are so much more than just a car – (think of Twiggy in the swinging 60′s, or these fine words – you’re only supposed to blow the bloody doors off’ ). This is what makes your search for your perfect MINI so complex. Choosing a MINI can present a minefield of options that need consideration, and that’s before you get into the technical stuff that goes on under the bonnet! It was for precisely this reason that Mrs MINI was Tracey’s inspiration – to help those of us who know what we want to find it without the hassle. 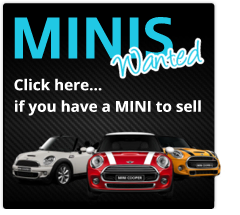 and we are a small friendly professional team, who are passionate about MINIs!